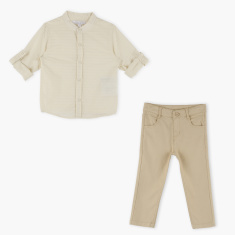 Get your kid this attractive set to make him look extremely trendy and smart. The striped pattern all over and the tabs on the sleeves add charm to the shirt. The pocket detail pants come with a button closure and zip fly that lend a desirable fit.